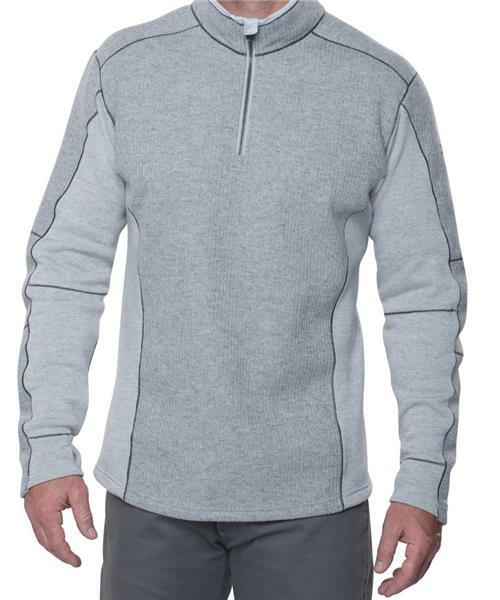 The Kuhl Skagen™ 1/4 ZIP features a knit bonded micro fleece paired with Ultraero™ melange fleece on the sides and under the arms for ultimate movement and comfort. Blending virgin wool and polyester, Ultraero is lightweight, durable, and odor- and pill-resistant. Sewn with Dynamik™ stitching for more stretch and strength than traditional flatlock, low bulk seams make layering comfortable and easy, while Kuhl’s exclusive articulated 5-panel sleeves provide better range of motion. The interior collar is lined with microsuede for warmth and comfort. The Skagen 1/4 ZIP features an ergonomic Kuhl crest zipper pull, draft flap and chin guard. Kuhl's signature thumb loops seal out the cold. Machine washable.